The Graduate Aptitude Test in Engineering (GATE) is a pan-India examination that aims to test the candidates comprehensive understanding of various engineering undergraduate subjects. GATE is conducted in collaboration with the IISc, Bangalore and seven IITs (Bombay, Delhi, Kanpur, Guwahati, Kharagpur, Chennai and Roorkee). The GATE score, reflecting the relative scoring of the candidates is used for admissions to various post-graduate programs like Masters in Engineering, M.tech and Ph.D. The GATE score is also used by various public sector undertakings (PSUs) for recruiting engineers at the graduate level into various entry level openings. GATE ME: Candidate with a bachelor’s degree in Mechanical Engineering or in the final year of engineering pursuing Mechanical engineering are eligible to apply for GATE 2016. To help with the preparation the GATE 2016 ME exam syllabus and exam pattern is enumerated. Linear Algebra: Matrices, linear equations, Eigen vectors. Numerical Methods: single and multi-step methods for differential equations, Fourier transform, Laplace transform, Z-transform. Differential equations: First order equation, Higher order linear differential equations with constant coefficients, Method of variation of parameters, Cauchy’s and Euler’s equations, Initial and boundary value problems, Partial Differential Equations and variable separable method. Forming, Joining, Machining, Metal Casting, Thermodynamics, Heat Transfer, Fluid Mechanics, Theory Of Machines, Strength Of materials, Engineering materials. Metrology and Inspection: Limits, fits and tolerances; linear and angular measurements; comparators; gauge design; interferometry; form and finish measurement; alignment and testing methods; tolerance analysis. Verbal ability: English grammar, verbal analogies, word groups, sentence completion, instructions, critical reasoning and verbal deductions. Now, that we are done with the GATE ME exam syllabus, lets move towards the exam pattern and important dates for GATE exam 2016. In the GATE ME exam 70% of the maximum marks is given to the Branch specific questions detailed in the syllabus above. 15% is reserved for the engineering maths section and 15% for the General Aptitude. Negative marking: For a 1 mark question, 1/3 marks will be deducted for every wrong answer and for every 2 marks question 2/3 marks will be deducted for every wrong answer. However, no negative marking for integer answer type questions. Multiple choice question(MCQs): They may carry 1 or 2 marks in all the sections. These questions are objective in nature and the answer is to be chosen from among four options listed. Numerical answer questions: the numerical answer or fill in the blank type of questions carry 1 or 2 marks in all sections. Here choices are not given. The answer has to be entered through a virtual keypad. The fill in the blanks type of questions generally comprise 35-40% of the paper. Online pattern: as GATE 2015, GATE 2016 ME exam is to be conducted on the online pattern. The paper is carried out online Computer Based Test at designated centers. The answers have to marked in the radio dialogue box using the mouse or entered through a virtual keyboard. An online calculator is provided which is on-screen. 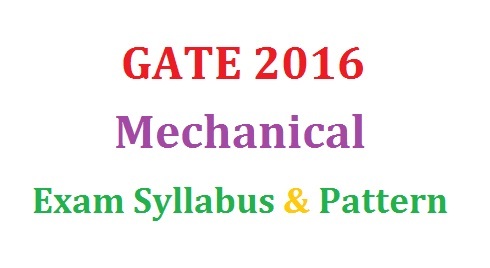 GATE Mechanical exam schedule 2016: The GATE mechanical exam form will be released in the first week of September, 2015 and registrations close by the first week of October. The exam date is yet to be announced and is expected to fall between 30th January 2016 and 7th February 2016. The Indian Institute of Science, Bangalore is the organizing institute of GATE 2016.